Fantastic eyes!! They must be getting a 360 degree view of their surroundings. Love'm, love'm, love'm. 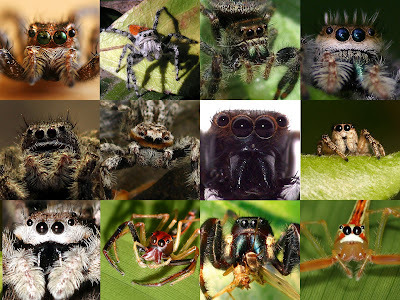 Absolutely LOVE spiders. Why is their HEAD so small as well as their THORAX, but yet on most carniverous arachinds, their ABDOMEN is HUGE?? Perhaps they have to produce so much silk is why. God bless you. They're the WOLF variety, most of 'em, are they not? I need to send you pictures of my jumping spider themed custom Keds slip-ons. My niece calls them my "pido" shoes ("pido" = "spider" in nice language. Wow, I hate to say it but these creatures that make my skin crawl really are beautiful!